A clever picture book about the fun of making new friends and building unlikely relationships-and playing in the snow! From the bestselling author of Nugget and Fang. Beaver is good at making just about everything...but not friends. One winter day, Beaver sees some snowflakes in the sky and gets a great idea: he'll make a friend. Yes! A snowman will be a great friend! Raccoon passes by as Beaver sets to work and offers a helping hand. The two work side by side to give their snowman everything a friend needs. But when the snowman proves to be a little cold, Beaver discovers that he may have unknowingly made another buddy instead. 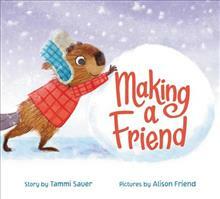 Perfect for snuggling together for a read-aloud, this sweet snowy friendship story from Tammi Sauer and Alison Friend will warm the hearts of young readers. Tammi Sauer is the author of such irresistible picture books as Making a Friend; Truck, Truck, Goose! ; I Love Cake! Starring Rabbit, Porcupine, and Moose; Your Alien; and Nugget & Fang. Tammi lives with her family in Oklahoma. You can follow her online at www.tammisauer.com and on Twitter @SauerTammi. Alison Friend is the author and illustrator of Freddy & Frito and the Clubhouse Rules, which Kirkus called a playful, lighthearted lesson about peacekeeping and place-keeping. She is also the illustrator of Making a Friend by Tammi Sauer. She lives with her family in the Lake District in England.